There are many spray guns on the market with different price tags and sometimes, due to budgetary limits, you may want to buy a low-cost spray gun for your painting needs. 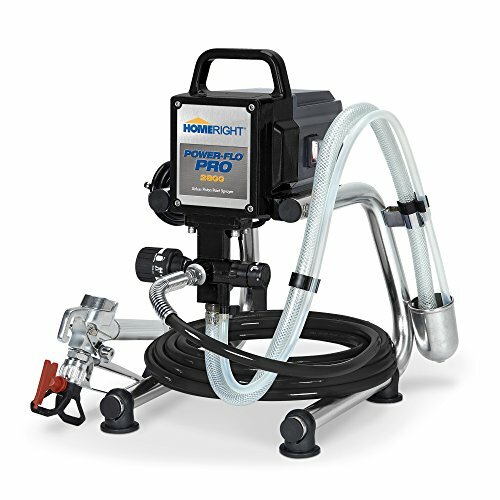 With proper knowledge, you can obtain a quality paint spraying gun for less than $700 which gives you the similar capabilities like professional units that are priced well over the $1500 mark. It is therefore important to understand the different categories available on the market together with their features to be able to make an informed choice. The three main types of spray guns are pressure feed guns, gravity feed guns, and siphon feed guns. The gravity feed type has a cup on the top of the gun while the siphon feed type has the cup on the bottom. The siphon feed guns are usually less expensive than the gravity feed spraying guns. Below you can pick the best unit if your budget is under $700. Feel free to browse through the list and hopefully you will be able to pick a unit for your desired painting need. It comes with a piston pump made from a durable stainless-steel material so that you can spray unthinned paints at high pressure. Its 0.15 tip is able to accommodate most painting tasks and it can be reversed to enable easier cleaning. The unit’s annual usage of 300 gallons is sufficient enough for 5 to 6 gallons weekly usage. The sprayer gives you ultimate control with its two air pressure speeds that consist of low and high mode. One such feature is the High-Efficiency Airless (HEA) technology that reduces overspray issues by up to 55 percent. The paint sprayer is also equipped with the Flex Liner Bag System which houses the paint. This feature makes the paint sprayer very easy to clean. 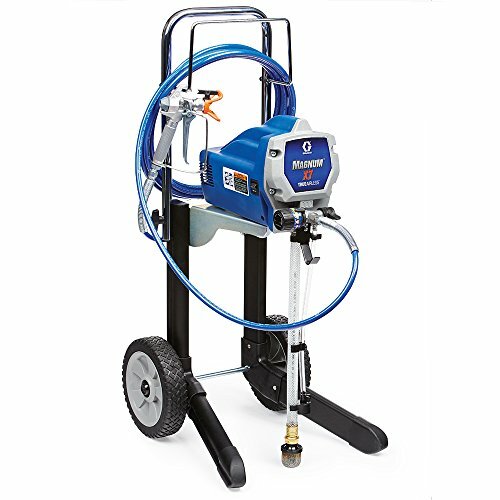 The Magnum 262805 is one of the professional paint sprayers from the Graco brand. It’s an impressive model that has been made from high-quality materials and a well-constructed frame. This sprayer has the capacity to handle a number of materials. It comes with a motor that is capable to handle both interior and exterior projects. 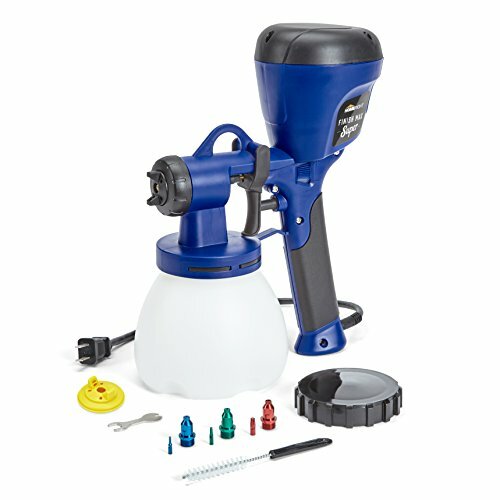 This sprayer can be used to paint doors, walls, ceilings, siding, and trimmings. It comes with a piston pump made from a durable stainless-steel material so that you can spray unthinned paints at high pressure. There is a flexible suction tube that can be used with both the one-gallon and 5-gallon containers. A paint saver hook is included to allow for direct connection to a bigger bucket and the connected bucket can then be carted around using the wheeled cart. The inclusion of the wheels on its frame is a great feature especially for people with back problems. There is a high quality 5/8 HP motor that generates a pressure of up to 3000 PSI to meet your painting needs. An adjustable pressure knob has been included so that you can adjust the pressure to the required levels. 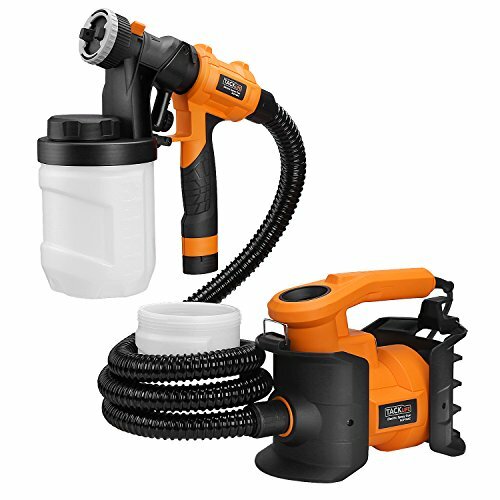 The sprayer’s power flush adapter can be connected to an ordinary garden hose to enhance the convenience of cleaning it. With the help of a spray tip, you can easily clean this unit whenever there is clogging. 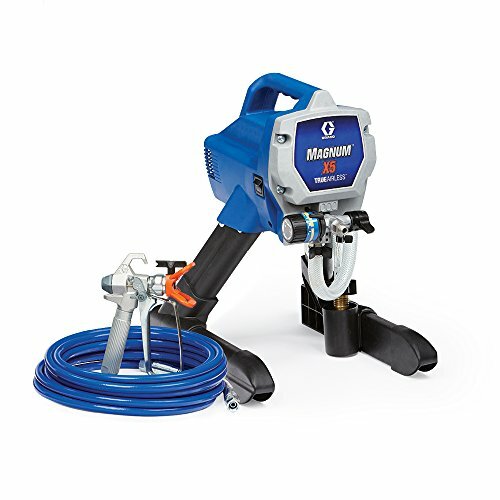 The Graco Magnum ProX19 is a high-performance painting tool among several other graco paint sprayer that has a traditional design and a longer hose that accommodates most painting jobs within the home. It has been designed for constant use and you can easily move around with it. Its 0.15 tip is able to accommodate most painting tasks and it can be reversed to enable easier cleaning. The recommended annual usage for this sprayer is 500 gallons which is more than enough to paint a number of rooms, fences, sidings, and trims. Its performance rating is 0.38 GPM while its maximum tip size is 0.019. With these features, you can handle anything between light coatings and oils & latex primers. For more detailed and fined finish, there is a premium SG3 gun included in the package. This premium gun comes with a swivel to minimize issues with long hoses. It uses a 1/4 inch 50-foot airless duraflex hose that enables you to reach more areas during work. You can extend this hose to 150 feet without causing any stress to the motor. A ProXChange feature minimizes the machine’s downtime as you can easily and quickly change the pump. When it comes to portability, it may not be the lightest model on the market, but it comes with wheels to enable easier maneuverability. A strong 7/8 horsepower dc motor is central to the versatility of this machine. The other features included in this unit are a high-quality stainless-steel pump, adjustable pressure knob, InstaClean pump filter, and paint container hook. The Graco Magnum ProX17 is an innovative paint sprayer that can be used by remodelers, property maintenance pros, and general contractors to tackle big homes, rental properties, and large-scale interior projects. A simple stand allows this machine to hold the paint bucket/canister while a 50 ft hose regulates the paint flow to ensure a steady supply. The unit’s annual usage of 300 gallons is sufficient enough for 5 to 6 gallons weekly usage. The limit for this machine’s tip size is 0.017 while its output is 0.34 GPM. This is sufficient enough to handle various categories of projects. An SG3 gun is included together with a full trigger for enhanced performance. A ProXChange Replacement Pump is included that enables quick pump replacement without any extra tools. The air pressure can be adjusted using the adjustable pressure knob to give you the ultimate control to spray paint on ceiling an wall. There is a power flush adapter that can be connected to a garden hose to facilitate faster cleanups. To handle big painting jobs, this sprayer has a powerful 3/4 horsepower motor that can be used to push materials through a 150-feet hose without any struggles. The unit measures 27 pounds but comes in a compact design that allows easier maneuvering, even in tight spaces. This is enhanced further by its fold & store design. The AutoPrime feature is a great addition to minimize clogging and priming-related issues. 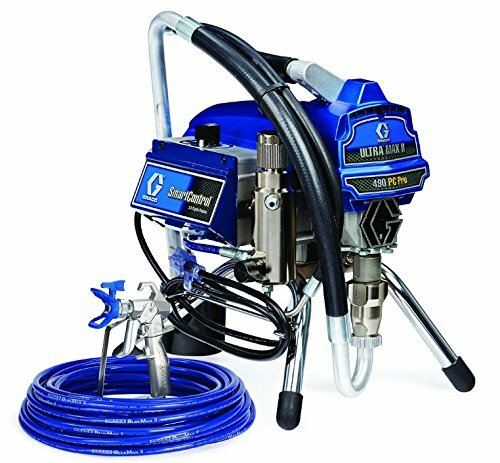 The Graco Ultra Airless Sprayer is an attractive and extremely reliable tool for any DIY enthusiast in the line of airless paint sprayers. It features a FlexiLiner bag system that allows you to spray in different directions. This feature saves you the trouble of holding the machine in a particular spraying position. It makes painting work fun, comfortable and you will be able to reach any spot. The fun part about this technology is that you can spray upside down without any hiccups. The unit allows for two spraying patterns depending on the surface. Some of the benefits of using this sprayer include a perfect airless finish, complete the task a very short time, and ultimate portability. The sprayer gives you ultimate control with its two air pressure speeds that consist of low and high mode. With this feature, you can control the spraying intensity to cover both thin and thick materials successfully. The RacX spray tip is one of the best you can get on the market. This unit uses this tip to deliver flawless finish in no time at all. The performance of this sprayer is quite impressive, and it sprays in a fast and efficient way. Its other features include a 32-ounce flexliner, triple triax piston pump, and the brilliant ProConnect technology. 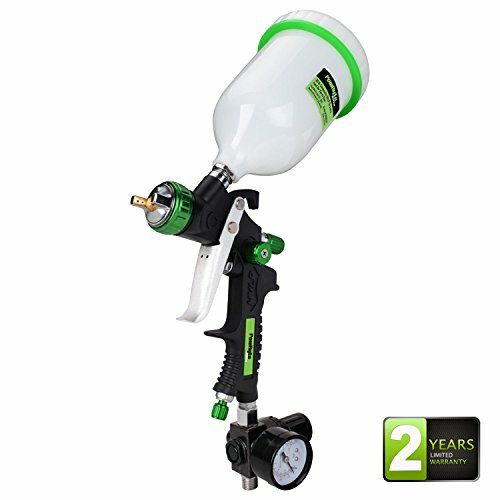 These features enable painting contractors to easily handle both small and large painting jobs using the same sprayer. This is a high-efficiency tool unit from Titan tool paint sprayers. The Titan brand is well known within the paint sprayer industry for its innovative and trusted products. The ControlMax 1700 Pro is one of their newest models and comes with a number of quality features. One such feature is the High-Efficiency Airless (HEA) technology that reduces overspray issues by up to 55 percent. There is also a durable pump that is able to last three times longer than other sprayers in its range. The sprayer’s durability is maximized by a fluid section which is easy to replace. The unit supports 100 feet hose and is covered by a two-year warranty period. There is a Sureflo Pusher Valve that enables you to use the priming feature at all time. Its 0.6 horsepower motor pumps a pressure of up to 1500 PSI. In terms of customer service, Titan strives to address the issues efficiently raised by its customers. By acquiring this unit, you get an opportunity to finish your painting projects more confidently knowing that you are equipped with a high-end sprayer this paint sprayer saves time as well. The pump is powerful and durable enough to spray un-thinned coatings. It includes a ControlMax 515 tip and a tip guard to give you more consistent finishes. This unit can be used on several coating materials for both exterior and interior jobs. The Graco Ultra 17M363 is a paint sprayer for professional use making its place into top notch handheld paint sprayers. The product comes with Dewalt 20V Lithium Ion batteries for optimum power. Its battery power is a major advantage which allows it to be the ideal choice of paint sprayer for outdoor use. Each charge of the battery lasts long enough to use 1 gallon of paint. The paint sprayer is also equipped with the Flex Liner Bag System which houses the paint. This feature makes the paint sprayer very easy to clean. Moreover, it features the TRIAX Triple Piston Pump which guarantees that the product can dispense paint at a high volume. The paint sprayer also features a No Inlet Check Valve which does not get stuck during painting. In addition to this, it also features a Smart-Control mechanism which makes it easy for a user to spray at high speeds without overspraying. Moreover, the product comes with an LED light indicator which allows the user to know how much power is left before the batteries drain. Furthermore, it provides two spray patterns which makes it a versatile paint sprayer. 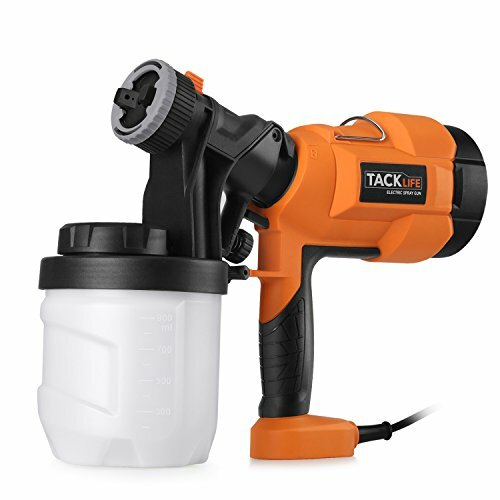 Overall, this is high-quality sprayer that is very easy to use, very easy to clean and comes with hassle-free warranty to make this a risk-free deal. 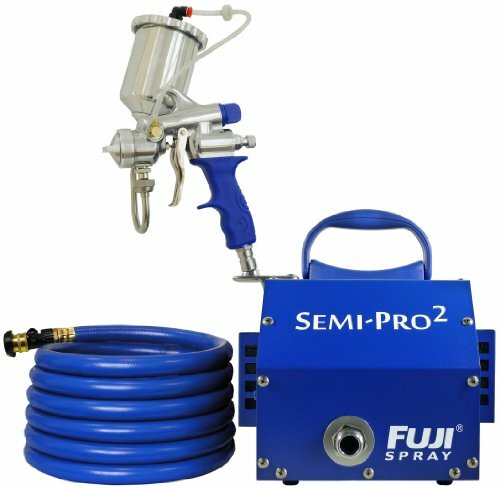 Our next pick is a HVLP sprayer from the Fuji stable and here is a top-rated HVLP paint sprayer that comes with a non-bleed feature. This guarantees that the painting done by the machine comes out smooth and fine. In addition to this, the product features a pattern control knob which makes it easier to operate and use. Furthermore, it comes with a 25ft hose which provides adequate working space for spray painting. Moreover, its hose features an air control valve which prevents overspraying. Furthermore, the product comes with a 400cc Gravity cup which guarantees that there is minimal need for refilling. At the center of its operation is a 2-stage motor which guarantees its effective performance. The motor ensures that it is capable of spraying a high volume of paint at low pressure. Moreover, the product comes with an adjustable spray gun which ensures that a user can spray multiple patterns. Additionally, the product is lightweight which makes it easy to move from one spot to another during painting projects. To cap it all, it comes with a 2-year warranty which guarantees that a buyer receives value for money spent. Our next pick is another HVLPspray system product that features a 1400W 2-stage bypass motor. The motor is extremely efficient and allows you to spray thicker paints with ease. In addition to this, the paint sprayer comes with a 25ft long hose which provides adequate space for an effective spray painting. The hose is also very flexible and guarantees easy movement. Moreover, the product comes with a fan control knob which allows the user to change spray patterns. The product also comes with a 400cc container which can accommodate a substantial quantity of paint to ensure that you won’t have to stop to refill paint frequently during a large-scale painting project. In addition to this, the paint sprayer is lightweight which makes it very easy to use however precise training related to the paint sprayer could be very beneficial. Moreover, it features an air control valve which ensures that there is no overspray which again, guarantees that the product delivers smooth and fine paint finishes. 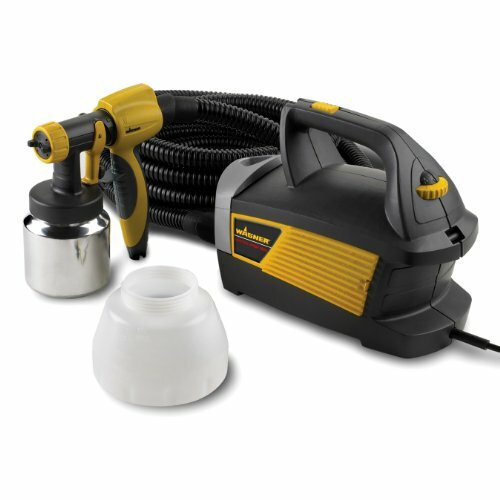 The paint sprayer is capable of handling different types of paints which makes it a versatile product. 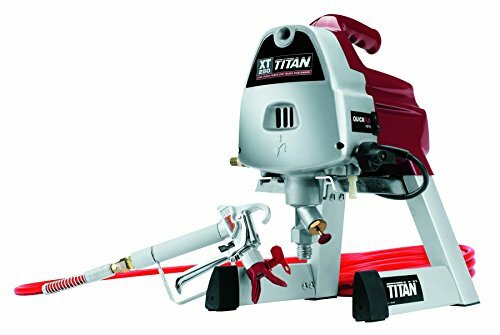 The Titan 0516012 Xt290 Airless Sprayer is a great product that is easy to setup and easy to operate. With its 5/8 horsepower motor, you can expect top-notch efficiency and performance. Moreover, the motor is able to dispense paint at the rate of 3000 PSI which equals to 1/3 gallon per minute. In addition to this, the product features a collapsible cart which ensures that it is very easy to move around the working place. In addition to this, the paint sprayer’s design also makes it ideal for large painting projects. Moreover, it is capable of supporting different types of paints which makes it a versatile paint sprayer. It is worthy of note that the product is durably constructed and with increased painting speed, you will be able to tackle large-scale projects in a short period of time. 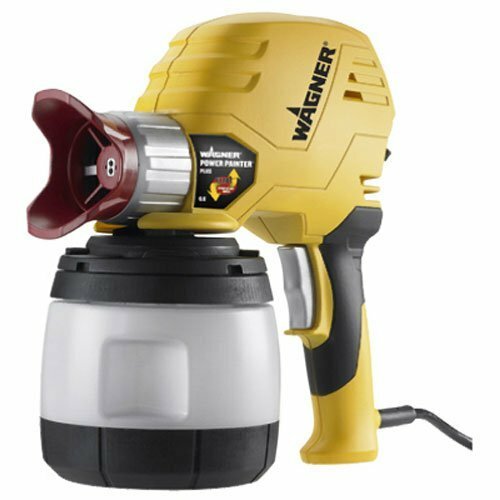 The product 9715 airless tool features a 3/4 HP Motor which makes it a highly capable wagner paint sprayer. Moreover, it comes with a wheeled cart which guarantees ease of movement during large-scale painting projects. In addition to these features, it also has a 50ft flexible hose which provides adequate space for effective spray painting. Additionally, the product is capable of spraying 0.35 gallons of paint per minute at the rate of up to 3000PSI. Furthermore, the product supports different types of painting materials which includes latex, oil-based paints, stains, sealers among others. Moreover, it has an auto-oiling mechanism and a 5-gallon paint bucket which ensures that you won’t have to stop to apply oil during work. In addition to these features, the product comes with a Twin Stroke Piston Pump which ensures that the product is capable of painting a variety of patterns. It also comes with a removable telescoping handle which facilitates ease of movement. Overall, this is a fantastic high efficiency airless spray painter that has been receiving excellent reviews all over the internet, plus it comes with 1-year replacement warranty. As you consider buying a spray gun below $700, the gravity feed and suction feed type will be a good starting point. We are taking a look at some of the features that will help you get a spray gun that works in the same way as a high-end model but costs less than $700. The first aspect you will consider is the performance of the spray gun. Each spray gun has a trigger-like attached that atomizes the content passing through the nozzle. 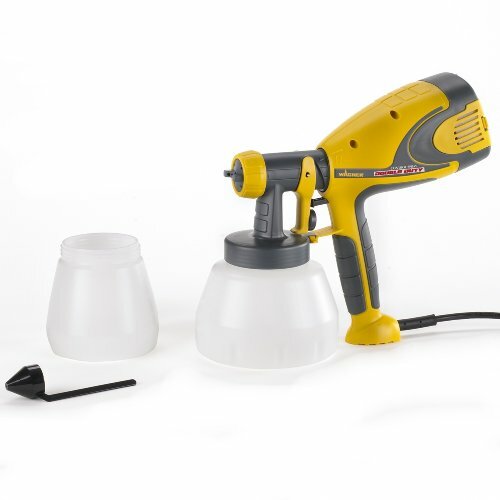 The conventional spray gun design comprises a paint cup with pressurizing technology, air compression system, a gun system, and a durable tubing for connecting these components. Additionally, you will find three different controls that work together to achieve optimum performance. This includes a so-calledair micrometer for fluid adjustment, adjusting the air pressure) and the fan control (for regulating spray pattern). To buy a high-performance unit priced below $700, you should look for one that ensures controlled atomization. Such a unit will allow for even flow of paint and a convenient supply of fluids. The other aspect that will help you to choose the best spray gun in this price category is the spray technology. The spray technology helps in converting fluid paint to millions of small atomized droplets. The main technologies available on the market are hydraulics, HVLP (high volume low pressure), and LVLP (low volume low pressure). Most gravity feed guns use the HVLP technology for their painting jobs. This technique delivers more fluids to the surface at a reduced pressure. The low pressure ensures even flow of fluids and minimizes overspray possibilities. The sprayit LVLP spray guns operate at low pressures and use lower air volume that their HVLP counterparts. These units don’t require large air compressors for painting work. An alternative to the HVLP guns is the RP spray gun. The RP gun uses reduced pressure and has a smaller compressor than the HVLP gun. It can, therefore, deliver better finishes at a higher transfer efficiency rate than the HVLP gun.There is then the airless spray gun option that is less turbulent and minimizes paint loss to a greater extent. With this unit, there is a specialized atomizing nozzle through which paint is pushed through. There are multistage pumps to create high pressure for atomizing paints. They are the ideal choice for large painting projects. There is then the nozzle factor that can help you to get a unit that fits your budget. The painting fluid usually gets atomized at the nozzle’s tip. Each gun has a separate passage for the fluid and air. The siphon feed gun usually atomizes by drawing up the paint while the gravity feed gun atomizes by pulling down the paint. If you are dealing with high pressure and low volume systems, it is important to consider buying a gravity feed unit. To get the best paint patterns, it is important to choose a high-quality nozzle. A quality nozzle will be able to handle thick paints. You then have to consider the issue of air compression for your the spray gun. Most of the popular spray guns use an air compressor system. For the project’s overall quality, it is important to choose the right aircompressor. A large compressor is likely to waste more paint than a small one. The small compressor, on the contrary, affects the quality of the project. It is therefore important to balance between the size of the compressor and the quality aspect. A right compression system should be easy to use. There is then the essential factor of safety. The safety features of a spray gun help in protecting you as the user and maintaining the quality of your work. You should also consider the different horsepower for the units. The higher the horsepower, the better the dispensation capabilities of your spray gun. A spray gun with good pressure enables quicker painting and faster accomplishment of tasks. The power ratings of a spray gun are measured in CFM and PSI. Depending on your painting needs, it is necessary to choose the right ratings for your gun. There is also the aspect of warranty and additional accessories. The longer the warranty period the better the choice. 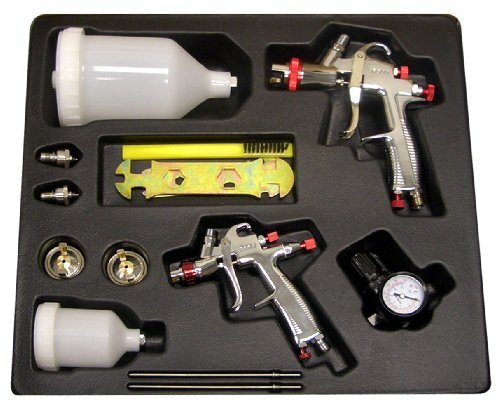 There are many different types of spray guns that you can invest in for less than $700. These spray guns vary in shape, power, size, and color. The price will always be the final factor that determines the sprayer that you end up with. However, you don’t have to invest thousands of dollars in a paint sprayer if you want to achieve a professional finish. The key is to find a balance between quality and price. The under $700 category is a good start if you are looking for a top-rated sprayer that doesn’t cost you an arm and a leg. Therefore, working on a limited budget should not hinder you from getting the best aspects of a spray gun. This is the reason we have explored the various factors that may help you choose the best tool that has the features of any other high-priced model but coming at an affordable price. A good spray gun will give you better interchangeability of components and high-quality machining. It also gives you better atomization and easier cleaning procedures. Such units can be used for commercial and professional tasks. It is therefore good to know that there are less expensive units on the market that can do a nice job just the same way high-priced models do.